Our exit surveys show that the top draw at our event is the food. The wide variety of culinary items range from standard corndogs, funnel cakes, and fresh squeezed lemonade, to unusual foods such as cabbage & noodles and chicken paprikash. For local food lovers seeking variety, there's only one place to go during fair week. The Cuyahoga County Board of Health closely monitors our vendors so that foods are of the highest quality and produced under exacting standards of sanitation. The Vendor Department controls the food units for the Fair, awarding contracts starting in January, up to the beginning of the fair week when necessary. The CCF generally requires food vendors to operate from a well-equipped, licensed trailer unit. An application form is available on-line or by mail for those interested in becoming a vendor. Preference is given to foods that are unusual and out-of-the-ordinary. The Vendor Department can be contacted at Concessions [at] cuyfair.com or 440/243-0090 ext. 112. Office hours are 10AM to 3PM, Mon-Wed-Fri year round. The Fair Vendor Department does not contract vendors for fairground events other than the fair. Contact the individual promoter of each event for particulars. 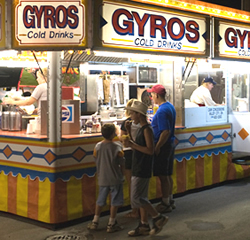 Click here to download the Fair Vendor Application or click here to view the 2019 Food Vendor Requirements. The Cuyaghoga County Fair has more than just great food for sale. Businesses, service organizations, government agencies and even political parties know that fairgoers stop at their booths for information, conversation or bargains. Fairgoers are shoppers, who spend dollars not only for things to eat, but also for things to wear, collect, and take home. As such, the fair provides a tremendous opportunity for all types of vendors. You can sign a contract with the Cuyahoga County Agricultural Society's Fair Vendor Department. No roving vendors or solicitors are allowed outside contracted space. Contracts can be obtained through the Fair Vendor Department. Booth sizes start at 10 x 10 foot, with tables and chairs available for rental. Outdoor spaces require a weather-proof covering. Basic electrical service is included in the privilege fee. For information or a space request form, email Concessions [at] cuyfair.com or call Diane Barton at 440-243-0090 ext. 112 between the hours of 10AM and 3PM Monday, Wednesday or Friday. Click here to download the 2019 Outdoor Merch Vendor Application or click here to view the 2019 Outdoor Merch Vendor Requirements. Click here to download the 2019 Indoor Merch Vendor Application or click here to view the 2019 Indoor Merch Vendor Requirements.